You must be a member of the Detroit Adventurers Group to attend this activity. Would you like to join this group? Well, if you did not know, here's the true true: "I'm a romantic!" There are so many of us who enjoy the music and lyrics of the songs we fondly remember growing up. Have you ever heard a song that stops you dead in your tracks? What about the time when you were up to...? Well, we'll have to talk about that together in person. As they say, keep personal thoughts to yourself. I sigh! 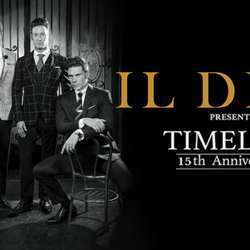 Well, Il Divo will be in town and as a ritual to recharge and replenish my soul, (Yes, I do have one! ), I go to their concert every time they are in town. Very important: Tickets are on sale tomorrow Protected content . Guess where I'll be at 10:00 a.m.? You bet, in line for two tickets. So get your tickets and we'll make more out of it. With Il Divo, they will sing a song in English, Spanish, French, Latin, and who knows what. So, hope to see all the romantics show. In case you have the winter blues, the holiday gloom, or the New Year Resolution withdrawal... Plan on this event to get you through. We're made out of tough stuff... More good things are coming our way. Smiling? Content? With gratitude, humbleness, and acceptance anything is possible... Protected content we come! Are you ready for a Timeless experience? Plan on it, bring your date, and enjoy the pleasure of anticipation. Once you learn the simple secret of anticipation, trivial things fall to the wayside, exponentially. Makes a great Christmas Gift, Birthday Gift, Valentine's Gift... Hey, man, I'm just sayin'. Imagine how thoughtful she will think of you? Bring the romantic out of you man and you will be living in her dreams. Okay, enough of the romantic-ness. Come alive with Timeless. Thanks for reading this far. Still smiling? I am, what a gift of the free smile. I'll be there with great company and I hope to see many of you, if you wish.